One of the largest and most fun-filled Corvette events in the world, the annual Corvettes at Carlisle features more than 4,000 Corvettes representing all generations of America’s classic sports car. Corvette enthusiasm is contagious with participation in autocross, dyno testing, burnouts, and the parade through historic downtown Carlisle. The excitement continues with a shopping experience that is second to none, including a huge swap meet with a wide variety of vendors, an all-Corvette car corral, manufacturers midway and instillation alley. Join us in celebrating the red, white and blue with a 158-Corvette American flag and a patriotic themed Chip’s Choice display. 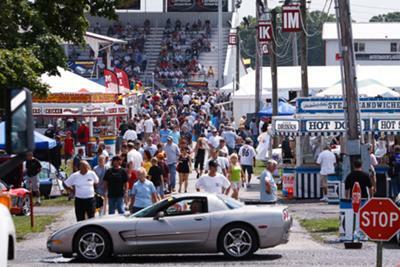 All roads lead to Carlisle, Pennsylvania for Corvettes at Carlisle, where you’ll find a community of passionate Corvette enthusiasts and over three decades of world class automotive events. Corvettes at Carlisle Import– August 27-29, 2010. Limited vending and car corral space still available. Visit www.Carlisle Events.com or call (717) 243-7855 for more details. Wow, how often do you get to see a Corvette these days? Thanks for letting us know about your annual Corvettes at Carlisle event. Looking forward to August.